For a film that doesn’t attempt to take sides, that’s a pretty strong way to open the film. And it lets the audience know straight away that this is going to be no sweet romance – it’ll be a cautionary tale. 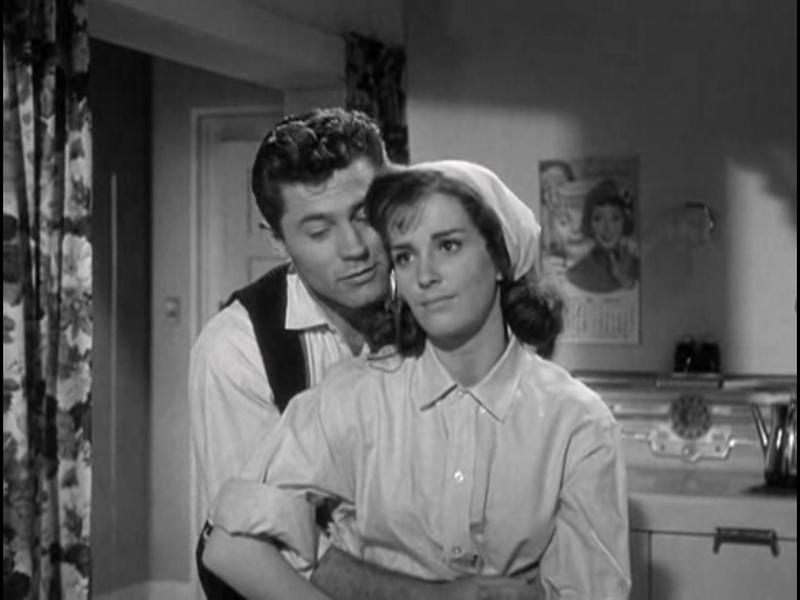 Seventeen-year-old Judy (Anita Sands) has eloped with her older boyfriend Steve (Ron Foster), a 24-year-old law student. Judy’s parents and friends are all surprised to hear of the marriage, and not everyone approves. Judy moves in with her new husband and is pelted with concerns and questions from everyone around her. Is she pregnant? Will she be able to balance school with being a good wife? But Judy gets more than prying questions when her ex-boyfriend Chuck (Chris Robinson) begins antagonizing her and Steve. Burt Topper directs 1959’s Diary of a High School Bride. As soon as they get back to their home town, trouble begins brewing. The couple uses the expected “You just don’t understand, we’re really in love!” argument after breaking the news to Judy’s parents. Things calm down for a while before the antagonism from Chuck picks up. The first half of the film attempts to show the day-to-day struggles that Judy faces as she balances her schooling and her home life. As a result, it can be a bit lackluster to watch at times, but the drama picks up in the second half without getting too over-the-top. There are a couple of odd elements at work here as well. A few random dance/song performances occur early in the film that don’t seem to have much of a place. The film is already quite short, running at just under 75 minutes. The performances, though not too long, take up valuable time that could have been used to further develop the story or the characters. There’s also an odd genre-swap near the end, from romantic drama to near-thriller. 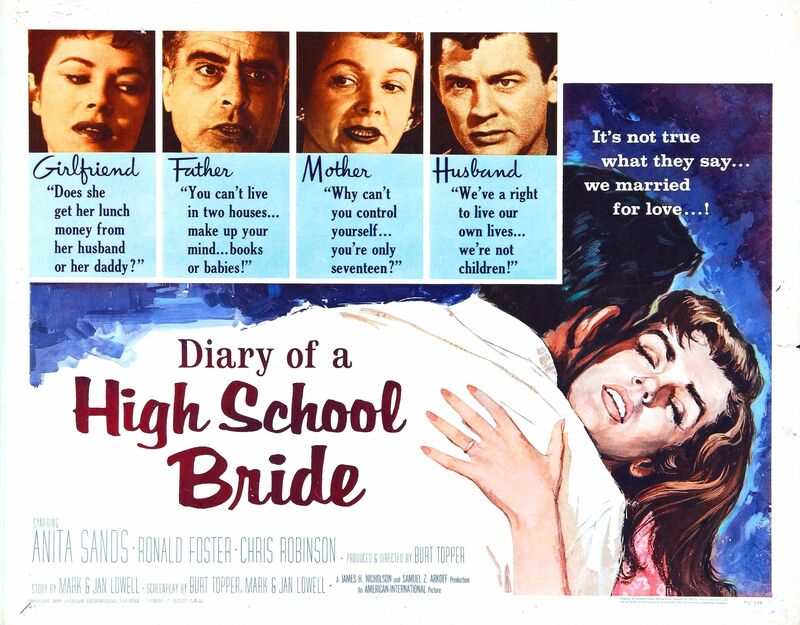 The Diary of a High School Bride isn’t a boring movie, but it isn’t as great (in the actual or in the “cheesy great” sense) as it could have been given the “controversial” subject matter for the time. It manages to hold the viewer’s attention and it improves as it progresses, but it could have been a lot better. Ack, it’s too bad it’s not “cheesy great”. It had real potential…! However, I want to see this movie; it seems oddly appealing. I’d say it’s still worth a watch. I was just left underwhelmed by it. With the warning in the opening and such a True Story magazine-esque title, my hopes were very high haha.